The idea of what may be a post apocalyptic world which is blazingly hot and makes “cold” an exceptionally valuable commodity intrigued me. I’d not come across the idea before. 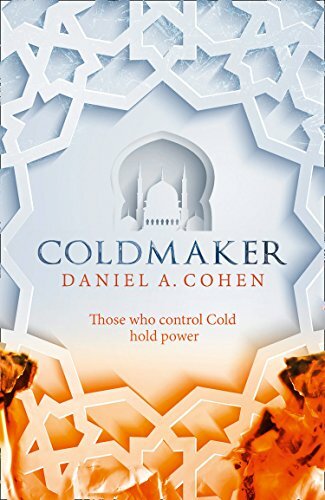 The Coldmaker by Daniel A Cohen follows Micah in such a world. He is effectively the lowest of the low and, in the hierarchy of the world, is “unworthy”. He is bright, he tinkers and is an inventor. Micah uses his talents and meets folk who are interested in those talents while a slave to the Nobles which is essentially what Jadens are. The big question – other than how to keep cool – is whether the Jadens should be subservient to the Nobles. The Nobles currently rule by fear and abuse of power claiming to have the right from their religion and the Khat. This is a book I really wanted to enjoy. The story outline looked interesting and different. However I never really found myself fully engaged with the story. I’ve taken a little time after finishing this to try and work out why. It took me a little while to understand the rules and power structure of this world. I’m actually still not sure that I fully grasp why the world is the way it is but it has been like it for 800 years. I found a number of the characters interesting but they did not seem fully developed for me. Micah’s inventions bother me. They often seem remarkable and there is not always much information on how they work or how he came to the conclusion that they would work. My final point is on the general tone of the book. Everything I’ve read about it suggests it is an adult book. There are aspects of the treatment of Jadens that make for uneasy reading. However, while I realise that Micah is a young teenager, the tone of the story feels like it is aimed more at a YA market. Not a bad read but I would have loved it to be better.